My new Mustang. - Page 3 - Rat Rods Rule / Undead Sleds - Hot Rods, Rat Rods, Beaters & Bikes... since 2007! It's really bent under there. Tonight I removed that bent fender and cut out the caved in inner fender so I can get a battery in it to let me drive it around the block to make sure it runs and shifts ok before I pull the motor. Up until now I have been running it with a battery sitting on top of the motor because the area where the battery goes is caved in. I found a lot of wood splinters, which supports my theory that he hit a telephone pole. I hope you can use a bunch of parts off that car! The wheels look cool too. Three of the wheels are perfect, the one on that side is hit hard. I am not a fan of the Shelby wheels so I may sell the 3 off and buy Bullit rims instead. Don has those on his 04 GT and I really like the look of them. You are right, I should be able to score a lot of good parts off of it to make the 6 cylinder car a v8 car. I will have some parts to sell off too, like the doors, trunk lid, and spoiler. It has a glass Steeda (we think) hood that has a crack in it from the wreck, but I might be able to sell it real cheap on CL and let someone do a little glass work and save some money. I am going to do what I did when I built my Caddy daily driver. I found a really clean body with a blown motor in it and then I found a 50,000 mile wrecked Caddy that I pirated everything out of to make one car. While I was in there, I redid all the AC and things like motor mounts, cooling system, belts, hoses, etc so I wouldn't have to go back in there for a long time. That is my plan here too, to replace all that kind of stuff so that it should be dependable for years. Stuff like AC, clutch, motor mounts, etc. That sounds like a good plan. The Bullit wheels will look good on your silver car. I nearly bought a fox body this week. It was a very good deal. You should have bought it, they are getting tougher to find, especially in good condition. I realize that Mustangs from 79 up are kinda belly button cars, but they are pretty much this generations 32 Ford. Very simple to work on, parts are available everywhere, and they are still pretty reasonable to buy. With a little work they run like mad too. Trouble is, they are also a little light in the rear and end up into telephone poles sometimes. I like that style of the "jellybean" Mustang better than I do the earlier design. They went back to the triple tail lights which say Mustang to me. So, if this one is after the roadster pickup, does that put the Bantam drag car on the back of the list? Today I put the spare tire on the front, put a battery in it, and took it for a test drive. Wanted to make sure it was ok before I start on the transplant. Motor runs great, good oil pressure, runs cool, and lots of power when I got on it. AC also blows ice cold. There is a slight grinding when going into 3rd gear, not sure if the clutch needs adjusting or if something is wrong internally. He might have been in 3rd when he wrecked, damaging something. It has a goofy short throw shifter on it and I couldn't get used to it, so maybe it is just me, but I am going to have the trans checked out before I put it in. There is a 10 x 20 storage unit opening up June 1st in our complex so I am going to stash it in there to keep any of the parts from getting stolen until I can get around to dismantling it. Our two shops are jammed with no room to put it in either one, so this will have to do for a while. I don't know ! The drag car keeps getting put onto the back burner. I think I have more projects than years left. I have to spend my day off Friday pulling the 6 out of the first Mustang. I advertised the motor and 5 speed on CL, and some guy wants it, so I have to get it pulled out. I didn't want anyone else doing it because that is the car I want to fix up and drive and didn't want someone else damaging it when removing stuff. I put an ad on Craigslist for the blown v6 and 5 speed out of the Mustang I am going to convert to a v8. A guy called this week and needs the 5 speed and is going to buy the v6 for parts. Today was my day off so I decided to pull the engine and trans so he can come pick it up tomorrow. My Son Dan was helping me, and as he was pulling the headers off from underneath, he said "I think I see why this thing quit running, there is a big hole in the oil pan !" When we got it out I was able to see what he was talking about, and it is a HUGE hole ! 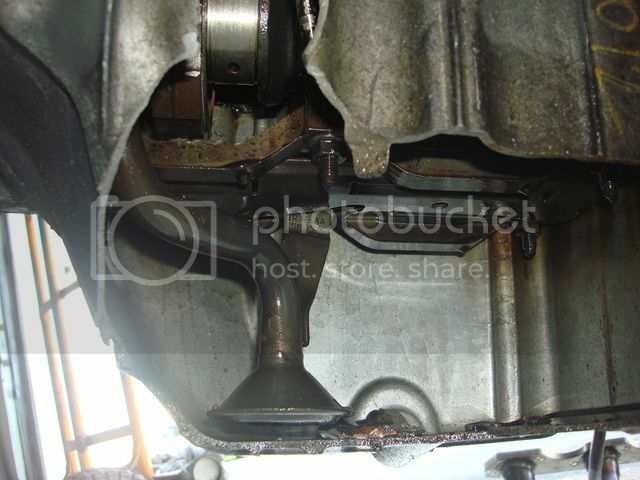 I can see one crank journal up in there where the connecting rod broke loose and took out a lot of parts. This is pretty funny to look at actually . I guess he wound it too tight one time too many. 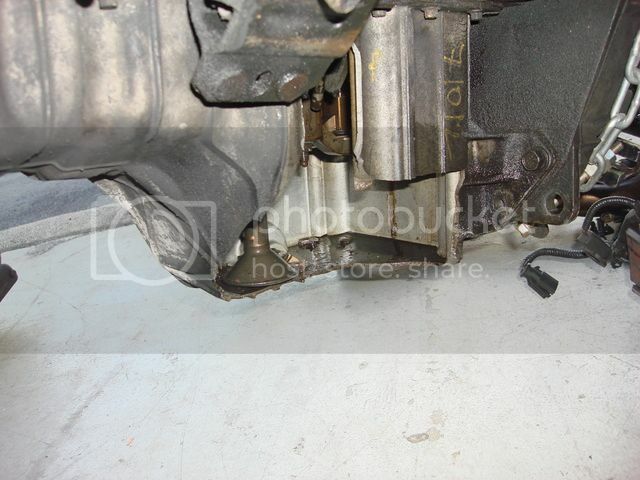 So that's what a "Dry Sump" looks like.